I get bored with regular curtains or drapes. I like something that shows some creativity. I was web surfing and found six window treatments that I thought were unique. 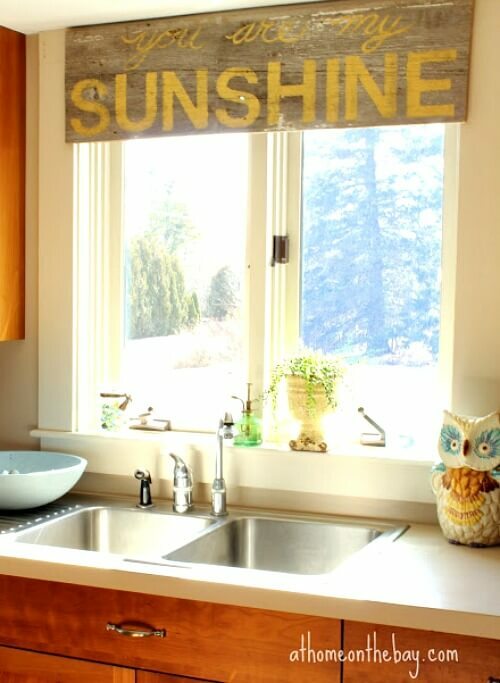 This is just a weathered sign used as a valance for the window. If your window doesn’t look out over a street or busy area, you could get by with this window treatment. Or you could add blinds underneath. 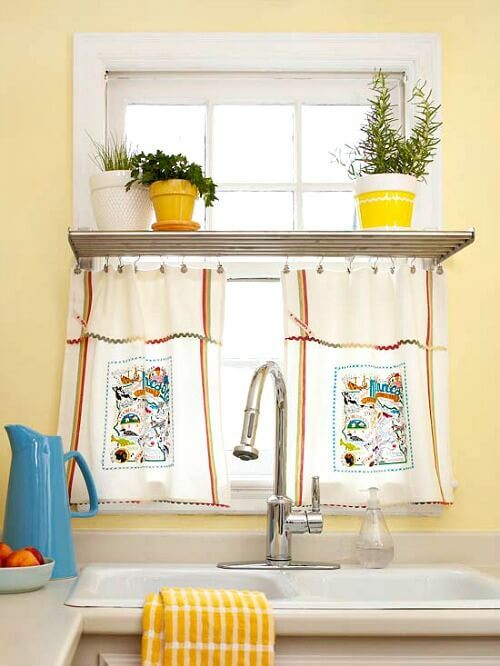 This window treatment reminds me of the vintage linens I have hanging in my kitchen window. But in this instance, it is vintage hankies. Cute and colorful! 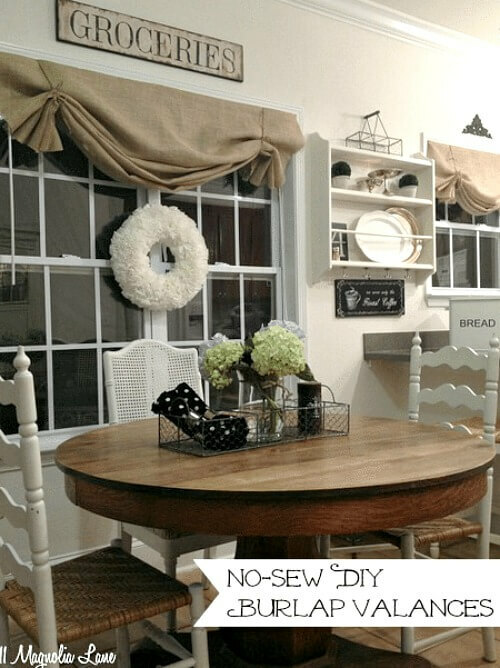 For those of you who love burlap (it makes me sneeze), this window treatment is for you. You could also use any kind of fabric. But burlap gives it a vintage-y look. This one is made up of fabric napkins, and what could be easier to hang or change out? 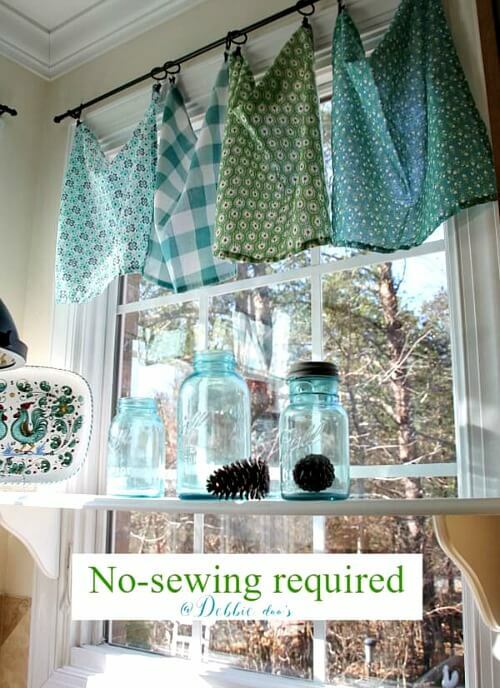 Coupled with the vintage mason jars on the shelf, this is really a sweet window treatment. I love this navy blue and white roller shade. The strip of fabric keeping it rolled up is also pleasing to the eye. Love the button! This one from BHG.com is fun. I can’t tell if the hooks hang from a rod or from the shelf mid-way up the window. I love the idea of the shelf for extra storage. You could put potted herbs on display, as seen here, or add other pretties to enjoy while you wash dishes. I love the burlap ones and the last picture with the shelf for herbs. I love the look and smell of fresh herbs but when I have cooked with them I have been disappointed, maybe I just don’t use enough of them. I have used fabric shower curtains for years as window curtains. they’re just the right length for large windows and they come in so many beautiful colors and prints or even solids and white. they just make me happy. and the ‘hooks’ are beautiful now too. not those old plastic rings. it makes for easy opening and closing of the curtains and I love that since I’m a light and fresh air junkie. Right now most of my windows have cheap blinds and no window treatment because I just cannot figure out what it is that would please me. I really like the kitchen window with the shelf and the potted plants. This looks pretty easy and functional. 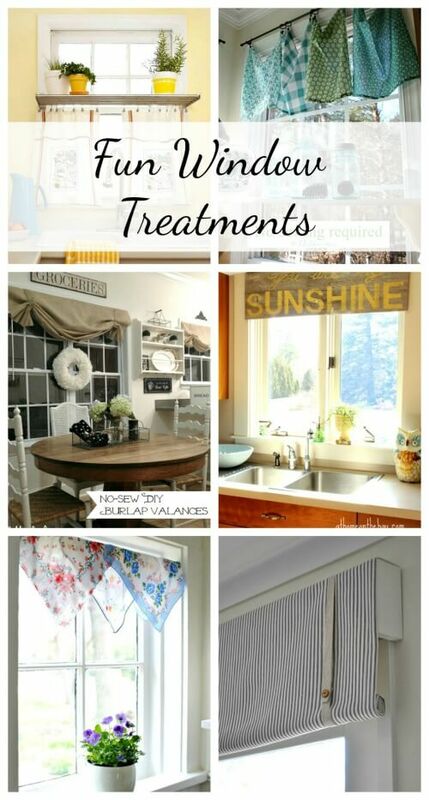 Actually I like all of these window treatments; they show creativity and make the windows look happy. 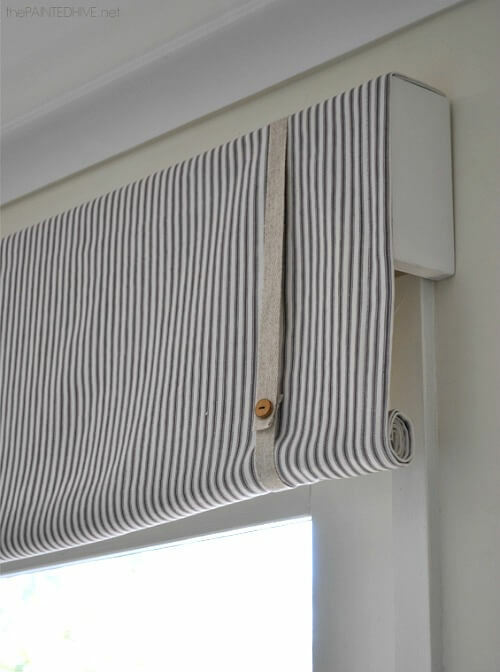 I love the blue and white strip roller shade also. Very nice indeed.~! I love the handkerchiefs. So cheerful! But I would definitely need a blind underneath for safety at night. Hard to pick a favorite! 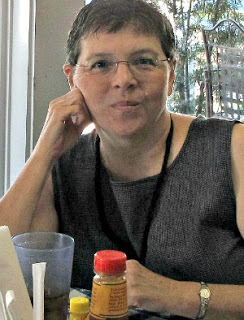 I tend to like a valance with blinds to keep out the hot Florida sun. I like to use different sorts of window treatments too — quick and easy ones, that is. 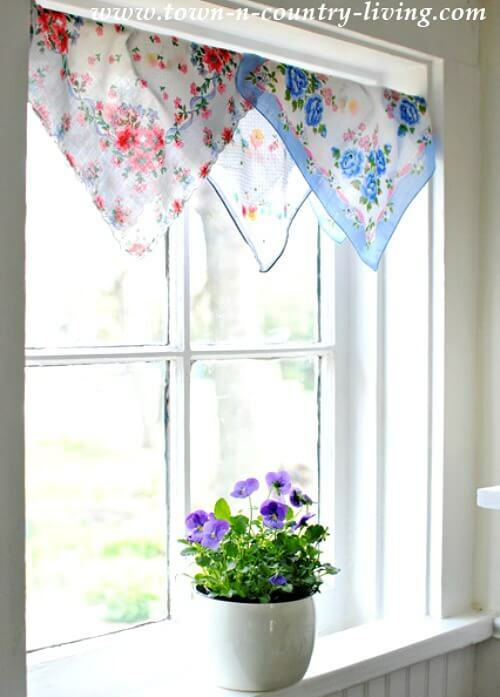 I have used both hankies and red bandanas as valances in the past. Currently I only have vinyl blinds up, and have rows of Cat’s Meow Village wooden houses sitting on the frames above the windows. (Those are decorative wooden houses made by an artist named Faline in Ohio that were really popular in the Ohio River Valley area in the ’80s and ’90s, and are still made today.) I really like the window featuring the shelf with the curtain below it. I love the colors in that photo too. Thanks for a fun post. I like it when you find interesting things like this to show us. Thanks!